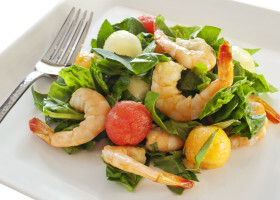 This vinaigrette is great on salads, but it is also great drizzled over grilled shrimp, scallops or lobster. Combine the shallot, lime juice, salt, pepper, sesame oil, corn oil, rice vinegar and honey in a jar with tight fitting lid. Seal and shake until well blended.